The gender pay gap shows the difference in average pay between men and women nationally or within a sector or organisation. The data that we are reporting for WaterAid UK is effective as at 5 April 2018. WaterAid’s total UK workforce at this date was 65% female and 35% male. The graph below illustrates our gender pay gap from April 2018. Our gap shows that men, on average (mean), earn 11.3% more than women. The midpoint of all hourly rates when listed in order (the median) shows that men earn 6% more than women. This has changed from 5 April 2017 when our mean was 11% and our median 9%. 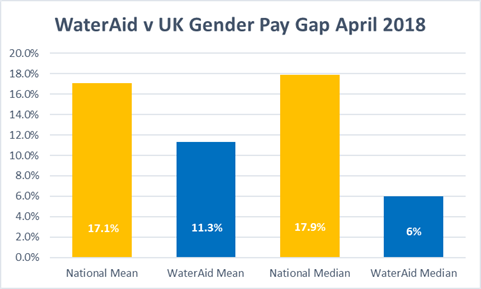 The graph below outlines WaterAid UK’s gender pay gap in comparison to data for the UK from the Office for National Statistics. We are required to show the proportion of males and females in each quartile pay band. This is calculated by listing all employee hourly rates in order of highest to lowest, and dividing the list into four equal quartiles. 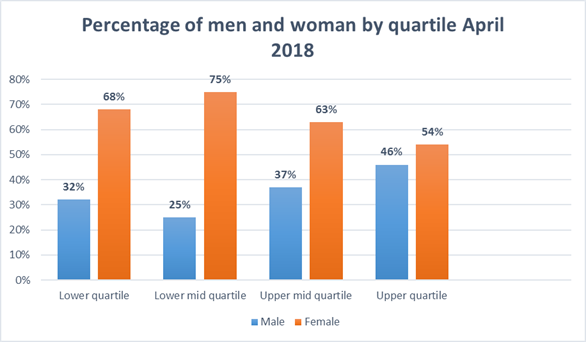 This graph highlights that men at WaterAid UK tend to be employed in more senior roles, whereas there is a greater spread of women across all quartiles. A total of 19 people received an ‘exceptional’ performance rating for 2017. This was rewarded through a 2% lump sum payment of basic salary. Under the legislation, this is considered a bonus. 7.6% (14) of our female employees and 5% (5) of male employees received a bonus. This is the last year that we will report on a bonus pay gap. We have now removed the bonus payment for exceptional performance. We believe that the distribution of our female and male workforce continue to contributes to our gender pay gap. We have a female dominated workforce and, proportionally, we have fewer men employed in junior roles and more men in senior roles, whereas we have a greater spread of women across all our grades. However, since April 2017, we have seen a slight shift in the distribution of men and women across the quartiles, which we believe has helped reduce the median gap from 9% to 6%. We are committed to fairness and transparency in managing the salaries of staff. We have a Global Reward Standard that is used to ensure consistency of reward principles across all WaterAid offices. We use a process of job evaluation to determine the scale and complexity of all our jobs. The evaluation outcome of a role enables us to consistently benchmark our roles externally, using a range of data. Our salaries and benefits are ‘market-driven’, which means we aim to pay salaries that are similar to those of staff doing similar roles in similar organisations. We have salary ranges that enable flexibility to attract, develop and retain our staff. We publish these ranges internally to ensure that all communications to staff about pay are transparent, accessible and clear. We seek to recruit the best person for the role ensuring they have the right skills, knowledge and experience to do the job and help us to achieve our mission. We encourage flexible working and seek to develop and progress our staff internally. We are part way through reviewing our job design to ensure that all roles are attractive to women and men. Continue to review our internal processes for any potential unconscious bias, in particular the recruitment process.